Time to gear up for the photo contest! Give us your best shot! Keep shooting and submit 2 photos (max) by April 20, 2019 (must be a valid library card holder). Submit your entries via email to photoworld.lab@gmail.com or as prints to the Library. Back to Prom 5K Race will benefit the library! Save the date and get registered! The seminars include free information on power of attorney for health care and other legal instructions. They will be held from 3 to 4:30 on February 27/May 7/August 26/and November 26, 2019. Please find additional information in the attached pdf. Thanks! Frigid temps mean we must close. Read more about Frigid temps mean we must close. 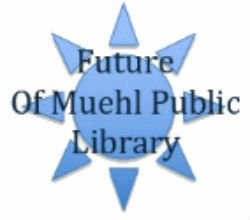 Muehl Public Library is proud to announce that we will be expanding our facilities. Our current facility was built in 1994. The visionaries predicted that more space would be needed in the future. The library is intended to be a multigenerational community learning center and our new space will be able to meet the needs of all ages. The 6-person crews will reside at Seymour High School and spend their days working for the elderly or others who cannot complete the work themselves. This work will include interior and exterior painting, weatherization, drywall, and construction of steps and wheelchair ramps. There is no charge to these families for labor or materials. Visit http://www.teenserve.org/2019-location-one-seymour-wi/ for more information. Learning Instruction for over 100 languages. Free with your InfoSoup Library card. Magazines, newspapers, homework help, business & health information and more! Great succinct summary of the Rolling Stones' rise to fame (for adults) and an in-depth look at their career (for kids).